Thunder and fireworks, while exciting, can be terrifying for your dog. Let’s look at ways to help them deal with the stress. Place your dogs in an area in the house that is isolated from everything. Bathrooms are good, as are internal bedrooms. A dressing room, should you have one, is the best, as the clothing on the walls effectively dampens any exterior sounds. Play music in the room where the dogs are. This results in a masking effect, and creates additional ambient sound. Play a selection with a wide range of frequency, highs and lows, and lots of drums. House music, rock music or country is a good choice during periods of loud thunder or fireworks. This is not the time for relaxing to Enya or yoga vibes. Ensure the music doesn’t stop when you are away, as the silence can be deafening. Place sound absorbent materials, such as carpeting, towels, blankets etc. in the room where the dogs are staying. This will in effect break up the sound transfer, and reduce the pressure reaching the dogs. By the way, this also helps with a noisy puppy; or a crying baby. Personally I am not a fan of drugs such as Prozak or Ace. However, if your dog has an extreme case of PTSD, or is severely affected by load noises, then this may be your only solution. They do work, and most have minimal side affects. Check with your vet first though. Feed your dogs shortly before the action is about to start. Most dogs take a nap after dinner, so may be more relaxed. However, if your dog has a tendency to throw up when fearful, then I would not feed them prior. Rather I would wait until you return home, or until after the fireworks are over. Yes, I am a trainer, so clearly I may be accused of bias. But the truth is training is very effective. The trick is to know how and when to train, and to know your limitations. Start by introducing your dog to noise on a limited basis, over a period of weeks. Don’t wait until July 3rd to start. Depending on your dog, and if you are reading this, chances are your dog has this issue, you may have to start small, and build up in baby steps. Don’t flood your dog. Build on successful results, and avoid overwhelming your dog, which could cause them to crash. Remember, positive is always more effective than pressure. Calming kind of goes with training. Basically you use your training foundation to maintain calm in your dog. Using a gentle assertive voice you show your dog there is nothing to fear. By “assertive” I do NOT mean dominant compulsion. I mean remaining calm and respectful, but using your “parent” voice. Use words such as “settle”, “relax” or “easy”. Avoid corrections, such as “NO!” These increase stress. Remain kind and fair to your dog, while showing them noise is just that; noise! Having a second dog can be useful. Or for that matter another animal. However, it only works if the companion is calm and relaxed. Placing two animals that are both reactive or stressful will result in a cumulative or even exponential effect. Anyone that knows me knows I love crates. If used correctly, they are awesome. But like any tool, you need to prepare and train. Crating plays on the denning principle in animals. Most dogs love their crates. Mine cannot wait to go into their crates, as it provides a safe and quiet place for them. If your dog is not comfortable in a crate, consult a professional trainer before leaving them in a crate over July 4th. Another option if you are out for the night is to board your dog at a kennel. Check that they have protocols in place to ensure your dog cannot break out of a kennel, or better still, that their facility is soundproof. Keep in mind that some kennels are full over July 4th, or have minimum stays. As a trainer, I love things that keep my dogs occupied. A bone, or a Kong filled with cheese or peanut butter will keep them occupied for hours. My dogs will chew on almost anything I give them. Avoid things that they could choke on, and if you have more than one dog, ensure you keep them separated to avoid conflict over a bone or toy. Did I mention crate training? This tip is a freebie. Look into the “thundershirts” that dogs can wear. They work on dogs that are already anxious, and may minimize their reactivity. I have found these work best on dogs that have been acclimated to them over a period of weeks. Don’t forget exercise! Run, swim or play with your dog for a hour prior to the evening. You probably need the exercise too; I know I do, but your dog will LOVE the additional attention. And after all, isn’t that what life is about. A tired dog is a sleepy dog. What did You Not Understand About …..? Have you ever been to the doctor, and not taken the meds they prescribe? Have you been told to slow down, but yet you still drive fast! I have days when I tell students: “Don’t do this; do that”. And then I watch them do exactly the opposite. Let me give you an example. Ms. Smith (yes, you guessed it, not her real name) comes to me and says her dog potty’s in her house. I suggest she crates the dog, until she is able to take it outside to go potty, and then either crates the dog again; or keeps it on leash. So what part of “Crate your Dog Did You Not Understand”? Let me be clear; I love my students; almost as much as I love their dogs! If you hire me to train your dog – well, actually train you; then why don’t you listen to what I say. As a professional trainer my job is to teach, and I love teaching. So in effect, you are great job security! But if you want results, then listen to what you are being taught to do. As a side note; if you have ever been to my classes, you will find I spend quite a bit of time explaining why you need to do something, as opposed to just telling you to do something.My philosophy is that if I can teach you to UNDERSTAND, the likelihood of you following my direction is higher. Dr. Mary Burch of the American Kennel Club (AKC) offers some advice on selecting a trainer and school by observing a class in action. Seeing a class in action is a true testimonial! I completely agree! So much so that for years we have encouraged people to come visit the school and take a tour. Check out the training, and see the dogs. I would love to respond to the points raised by Dr. Burch. Instructors need to be experts in teaching people, not just dogs. Handler training makes up about 80% of the team. Observe the instructor’s knowledge of dogs. Partners staff undergo extensive training in general dog knowledge, sports dogs, animal husbandry and behavior modification. Observe the instructor’s communication style with students—pleasant, reinforcing vs. bossy and sarcastic. Our training staff are specifically selected and educated in teaching people in a pleasant, non-confrontational and positive manner. Sarcasm has no place in our school. Observe the Organization of the class. How long on each topic, how many students/dogs? 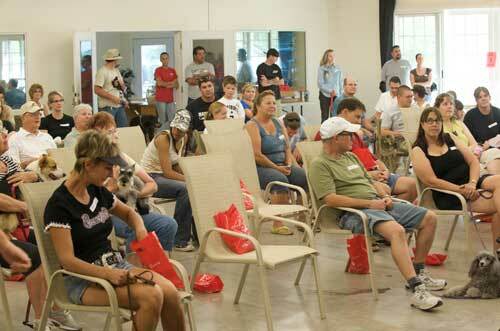 Our classes are generally 8 to 10 dogs, with two (or more) instructors to a class. Some classes have a ratio of two dogs to a trainer. Observe the Curriculum—does it teach all you want to learn? Our curriculums are specifically tailored to the level of class, as well as to ensure all topics are addressed. While we do not pre-publish our class curriculums, you are welcome to discuss them with our staff prior to signing up for class. Do the dogs look happy, eager to work vs. bored or nervous? We focus lots of attention on training the dogs to be happy, excited and passionate about class. Do the human students look happy, eager to work, or frustrated? Come see for yourself! Few people ever think our classes are slow. Is the instruction presented and sequenced so that students and dogs are having success? Our classes are carefully structured by our Training Director to build on a foundation in baby steps. Teaching methods—for example, do you spend all the time listening to the instructor talk? Clearly we love to teach; and some of that involves talking. But we also focus on theory, explanations and practical application of the drills. Instructors will explain, then demonstrate each step. Then the students are encouraged to do the same, and supported if they struggle. Observe the instructor’s ability to handle any behavior problems or student questions. Instructors are trained to answer questions and maintain safety. They can also call in an assistant or senior instructor if needed. With 30 years of training behind us, there is not a lot we haven’t covered. We offer classes most weekday evenings, and on Saturday mornings. Do we pass the AKC Trainer Test? Normally, I hate tests! They stress me out, make me nervous and generally mess up what could be a great day! But I will make an exception, just for you! Last week I was reading a blog by well-known Animal Behaviorist, Dr. Mary Burch. She is the Director of the AKC CGC program, and has been instrumental in improving the quality of training. In her blog, as well as in her book, she offers advice on Choosing the Right Trainer. I decided to put myself, and Partners Dog Training School, to the TEST! TIP: I added some comments to educate you, and your friends in what else to look for; and what to ask! 1. How long have you been training dogs? My answer: About thirty years. Tip: Ask how much of that time was spent as a professional, full-time trainer, actually making a living from teaching dogs. In my case, 20 years. 2. What kinds of classes do you teach? My answer: I teach obedience, protection, agility, dock diving, service dogs, detection dogs and search & rescue. 3. Have you put any titles on your own dogs? Yes, French Ring Title, AKC Tracker Dog Title, Schutzhund title, Obedience title, Agility Title, AKC CGC titles. Tip: Ask if the trainer actually trained the dog from scratch, or did they Title a dog that was purchased as an already Titled dog. 4. What dog sports do you participate in or have you participated in? My answer: French Ring, Agility, Dock Diving, Herding, Obedience. 5. What is your basic philosophy of training? My answer: I believe in positive reward based training, but with an element of minor compulsion training. By the way, some trainers believe in exclusively training using positive, and others use more compulsion, so this is a complex question. In addition, I will use different techniques on different dogs and in different situations. I almost always chat with clients prior to training, to ensure they are comfortable with my approach and reasoning. Tip: Ask the trainer if you can observe them teaching a class, or teaching a lesson. 6. What kind of equipment will we be using in class (e.g., collars, etc). My answer: We use all types of equipment, from collars to martingales. Generally we try to match the equipment to the situation, and in some cases, we also have to work with what we have. 7. Do you use food rewards? Corrections? If so, can you tell me about these. My answer: Yes, we use food reward, mostly to build the behavior through motivated repetition. And yes, we do use limited (soft) corrections. As a specialist behavioral school, we are often the point of last resort, and this leads to us having to find solutions to very difficult answers. Many other trainers refer their failures to us, and we are proud of the fact that we succeed in most of these cases. 8. Are all sizes of dogs together? My answer: No, we train like-with-like. And each dog has its own kennel, its own crate and its own training session. Dogs need to feel comfortable around other dogs. 9. Do you know your drop-out rate? How many students graduate from your classes? My answer: Our drop out rate in the basic (level 1) classes is about 1.5 in 10. In the advanced classes, we have very few drop-outs, as these students have trained with us for a while, and are loyal and committed clients. 10. After the beginning class, do many students go on for additional training? We are especially proud that more than half, roughly 6 in 10 students, advance on to other classes. Some of these are more advanced, and others are part of our sports program. We specifically developed our agility, dock diving and protection sports facilities to accommodate the needs of our students interested in further training for their families. Tip: Ask trainers what investment they have in providing sports training for clients. Do they actually work out of a school? Or do they just use a public park? I have one more TIP to add to this. Ask the trainer to connect on Facebook, and read through the posts. Remember, you are interviewing someone who will in effect be working for you, and its important to know them on a personal basis. My Facebook, as well as that of the school, is open for all to see. In my next blog, I will look at the questions Dr. Burch asks when observing a class!